Welcome to GraspingGod.com's Christian Jewelry shopping page! We couldn't ignore the demand people have for religious jewelry... Case in point: YOU! It's no accident you're visiting here today. Like so many other Christians, you adore God's precious gems and beautiful metals fashioned into glamorous jewelry. Heaven will be adorned with such beautiful precious gems and minerals, but in the meantime, we'll have to satisfy ourselves with wearing them! If you haven't found the perfect Christian gift yet, you've come to the right place. Take your time browsing these stores today and find a unique, special gift for your loved one. There are some nice jewelry stores below, but feel free to suggest other jewelry stores for this directory. I'll let you start shopping. Let me know what you think (click): Contact Us. Apples of Gold is a premier jewelry company with over 5,000 products from which to choose, including diamond rings, wedding bands, and gold jewelry. Their name, Apples of Gold Jewelry, is inspired by the Book of Proverbs, and embodies their business ethics: "A word fitly spoken is like apples of gold, in settings of silver." (Proverbs 25:11). Click on the following links and browse their beautiful jewelry. Take note of their religious crosses and other fine Christian items. Christian Jewelry - Gold Crosses, Christian Rings, Christian Wedding Bands! 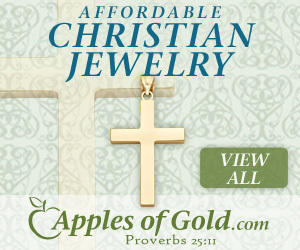 Apples of Gold - Jewelry from a Company Who Honors God! I love how this God-fearing company introduces their fine jewelry store, "Christian Jewelry has never been as cool and bold as the jewelry created by Kerusso. Each piece of jewelry features the message of Christ and the love that He has for each of us." What more can be said? "Kerusso" is a Greek word that means "proclaim" and this company lives by their name, because they proclaim the name of Jesus Christ throughout their entire product selection, including their religious jewelry. Kerusso Christian Rings set the standard. Their fun and fashionable rings are made of non-corrosive stainless steel and feature a unique "spinner" that attracts attention to His message." They have tons of really neat, cool jewelry. Click on their banner or link and experience a devoted Christian retailer. JewelBasket.com is a terrific online jewelry retailer, featuring the latest styling and competitive prices. They specialize in hand-crafted 14k fine jewelry, and feature an array of gold chains, rings, pendants, earrings, bracelets, and charms. They put the customer first in all transactions and believe that customer service is a top priority. With over 7,000 items, JewelBasket.com sells a wide range of jewelry & gifts to suit all ages and price ranges. For the best prices and widest selection on Religious Jewelry - Click Here! Heartsmith.com was founded 15 years ago, and offers jewelry catering to the "sentimental at heart." They specialize in lockets, and other engravable items for women, children, and men. They host one of the largest jewelry collections, in all styles, designs, and price ranges. They like to handle handmade, unique lockets from smaller manufacturers. Their product assortment, being updated frequently, includes gift items for children, bridesmaids, new mothers, family lockets, military pendants, religious jewelry, and soon to be announced cremation jewelry. Click the banner above or link below to browse the HEARTSMITH store. Religious jewelry here at DaySpring is developed to assist you in your mission to share your faith. Every jewelry designer realizes that you have a desire to witness your faith by your personal accessories. Keeping that quest in mind, each designer has put special thought into bringing the true meaning of Christian faith into every fine piece of jewelry in their collection. Dayspring has a fine jewelry store for you. Visit their large display of faith inspired jewelry. C28 will fill your senses as you enter their jewelry store. The jewelry is breath-taking, and it sends a great message of love and faith. You can follow Christ's command to "take up your cross" literally with C28's selection of stylish Christian cross rings, wedding rings, and Christian cross jewelry. Also, be sure to visit their large selection of True Love Waits, Purity rings, Abstinence bands, and Chastity rings. They're running some very generous sales through December, so step inside and enjoy some Christmas shopping. Share on Facebook below and click for more Christian Jewelry gifts. Special Note: I'm grateful to Big Book Media & Free Bible Images, stock.xchng, Morgue Files, and Stock Photos For Free for the use of their photos for our Religious Jewelry Directory page.